Um, WOW. 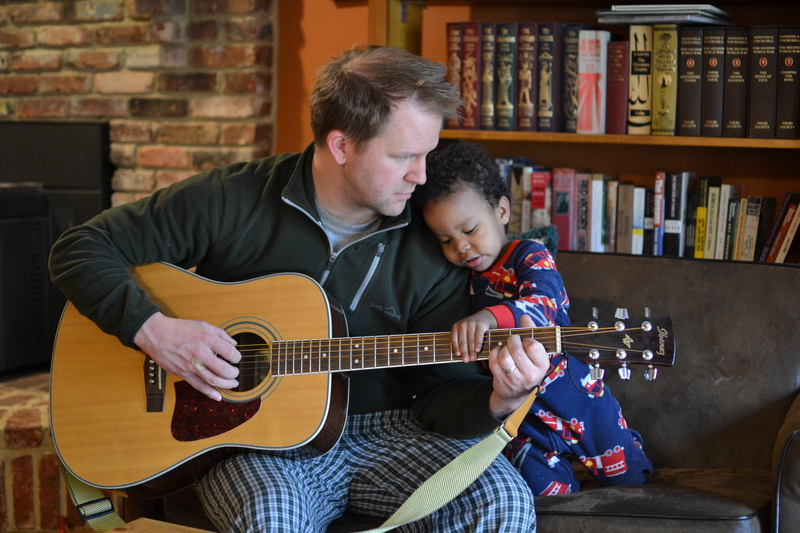 Time is a’ flyin’ and our little guy will be two in just a couple weeks. Gulp. I really had the best of intentions to get this post out on time for once, but as usual other stuff just got in the way. I am absolutely amazed at how much Isaac has grown in the last month. By how much he has changed. He’s grown two inches since Christmas, put on two pounds, and oh my he is talking and just so much a little boy all of a sudden! This talking thing is so much fun. One of his favorite games is to take a roll of packing tape and send it down his car ramp (he’ll repeat “make it roll” while he’s doing it), letting it roll all the way into the dining room and then fetching it and doing it over and over and over again. He loves it when something gets in the way of the tape’s path across the floor – “tape hit Mommy!” or “tape hit chair!” or even better, “tape hit Eddie!”. He loves pointing out that he’s baby and I’m the mommy. 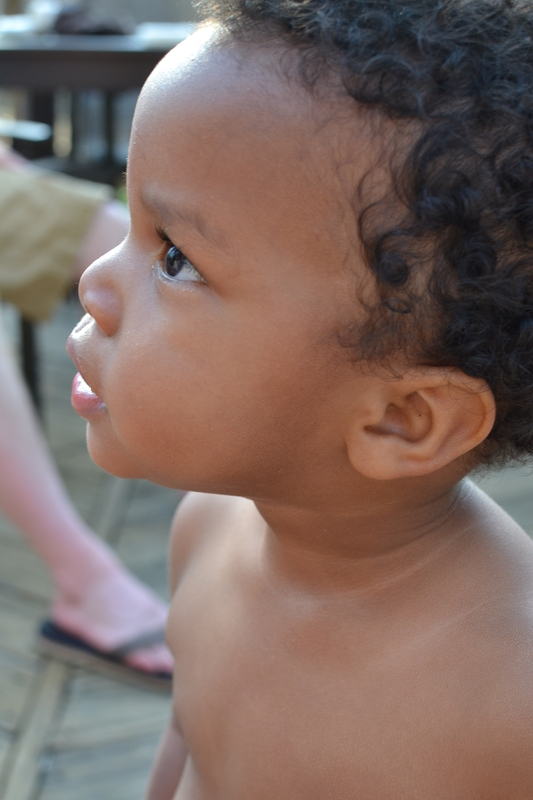 He absolutely loves saying his name, “Guy-zik”. He loves when I tell him “Mommy is going to eat some chicken, do you want some?”, because “Baby eat chicken” of course :). 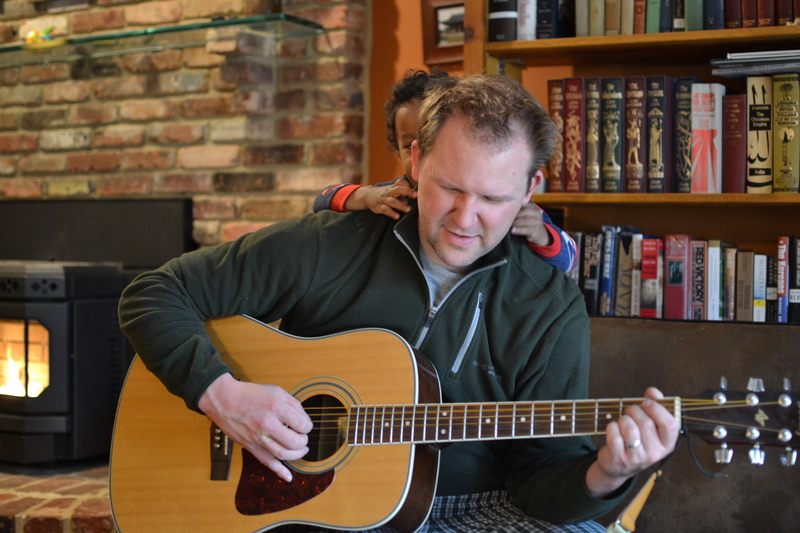 When he’s too busy playing to kiss Daddy goodbye in the morning, he’ll see me kiss Chris and run over yelling “kiss Daddy, kiss Daddy!”. We talk about all of his friends in his crib -“Pooh Bear is sleeping. Donkey is sleeping. Curious George is sleeping.” – and finally he’s convinced, and he tells us “Baby sleeping”. He tries to sweet-talk the dogs into playing with him, following them around the house and saying “Honey, hu’mere. Hu’mere.” (Come here). And trying to get the cat to come downstairs with us in the morning, “‘Mon, tat. ‘Mon taaaaat.” (Come on cat). We called the doggy to finish off a bowl of milk I had set out for the cat, and as Gabby came around the corner, Isaac said “Here he comes!”, haha. Ozzy was purring this morning and rubbing his head on the door hinge and the edge of the cabinet – Isaac kept trying to bat him away telling him, “Stop it tat!”. 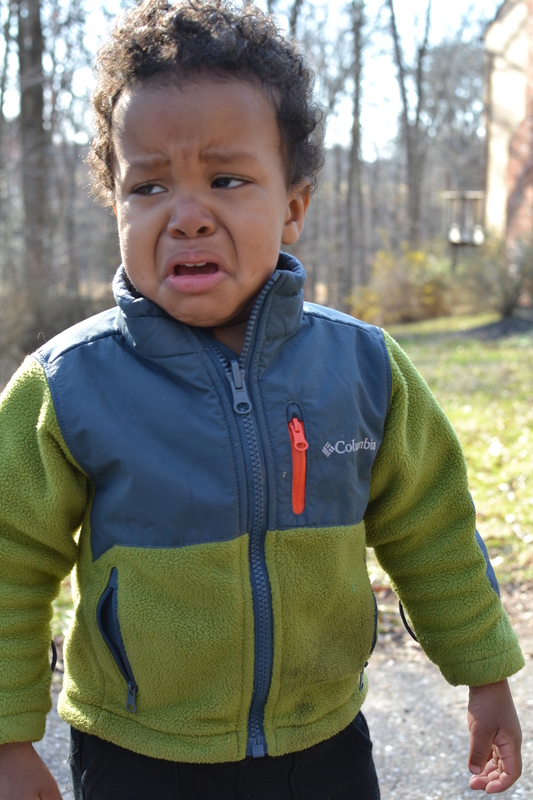 Mimi brought him upstairs to dress him and flipped the light switch, but nothing happened. I had turned the light off at the base of the fan, but she didn’t realize that, so she was asking him “What happened to the light?”. Later at nap time, he looked up and asked me “Happened light?” Happened? Wha’ happened light?” He loves asking, “Wha’ Daddy doin’?” and then telling me, “Daddy working”. He’ll manage to spear a piece of food on his fork and get it into his mouth the very first try, and he’ll say “there ya go!” or “I got it!”. Or when he’s managed to climb up on the recliner by himself. Or completed any other difficult task. Now that he’s saying it, I realize how often it comes out of my mouth! He’ll pick up a large rock outside, or one of his larger toys and tell me “hebby” as he hefts it around. Occasionally he’ll pick up something tiny and obviously very light and say “hebby” and just smile at me like he knows he’s being silly. He’s a big eater these days! He’ll almost eat anything I put in front of him, although he still doesn’t like to have the same thing more than once or twice in a row (except eggs and bacon, thank goodness!). One morning he asked for my homemade honey and maple syrup-sweetened pumpkin pie for breakfast and ate a giant (even for an adult) slice. Then he ate the yolk of one fried egg, some sauerkraut, and asked for fermented beets. The boy knows what he wants! He loves tuna or salmon salad, any kind of Indian food, fancy olives, smoked salmon, pears and oranges, to name a few. He adores Five Guys, which he have every couple of weeks or so. Any time he starts to feel hungry, especially when we’re out running errands, he’ll starting chanting “burgerfriesburgerfries”. You’d think we had it more often the way he obsesses about it, haha. When I serve him something that needs to be cut up, he’ll tell me “hevs, hevs” (cut in half). 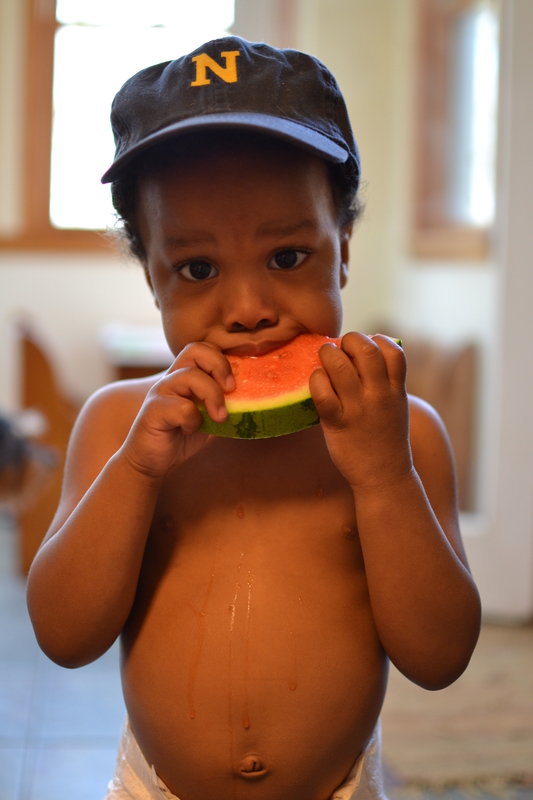 His current obsession is watermelon, and begged for one for a week before I finally gave in and bought him one even though they are out of season, teeny tiny, and expensive. He ate the entire thing in only three days. It was the last thing he said as he fell asleep for his (now rare) nap the other day, and the first word out of his mouth when he woke up! He’s getting so good at using please and thank you. He will say please when prompted, and when he wants something reaaaally bad and you’ve told him no, he’ll throw a “peas” in there just in case Mama’s feeling soft :). Lately, we haven’t even had to prompt him to say thank you, and I love hearing it come out of his mouth automatically after you hand him something! He finds it hilarious when I instruct him to say “yes ma’am” or “May I be excused?”, and will do it with a huge smile. He says “bless you” when anyone sneezes, every time, and when Mommy forgets to say when he sneezes, he’ll say it for himself :). He’s so darn observant. He helps me unload the dishwasher and can identify who uses what mugs – Mimi’s, Daddy’s, Mommy’s, Baby’s. When I’m folding laundry he knows whose clothes are whose. He has a fantastic memory! You do something once and he’ll remember it, even months later. 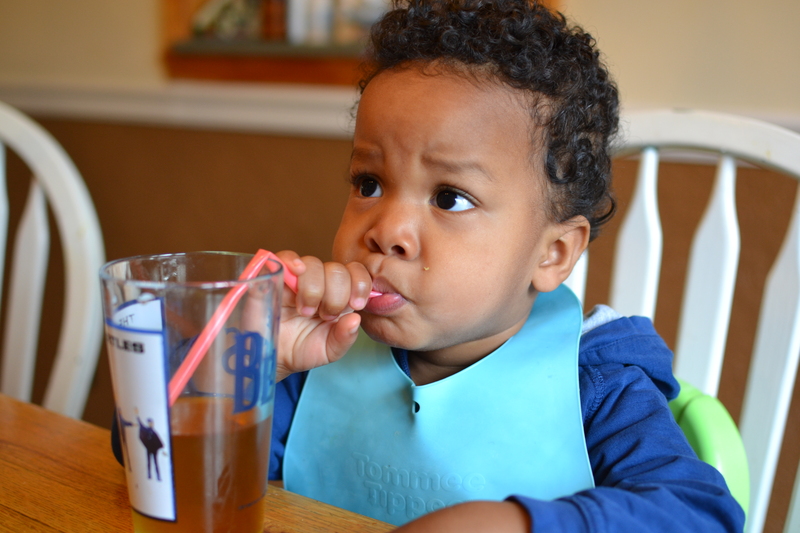 Just the other morning, while he was eating his breakfast, I was looking for his sippy cup. I asked him where it was and he looked up mid-bite and said, “chair”. Sure enough, it was sitting on the chair in the den! I was amazed. He devours books. Some days we read the same 5 or 6 books 10 and 20 times, and other days we’ll sit and go through a stack of 20 once and he’s done. He still loves his board books, but he can sit through longer stories now, and really picks up details in the pictures and learns new words every time, it seems. He knows his colors – orange is by far his favorite, followed probably by red and blue. He also knows green, yellow, purple, black, brown, white and grey. 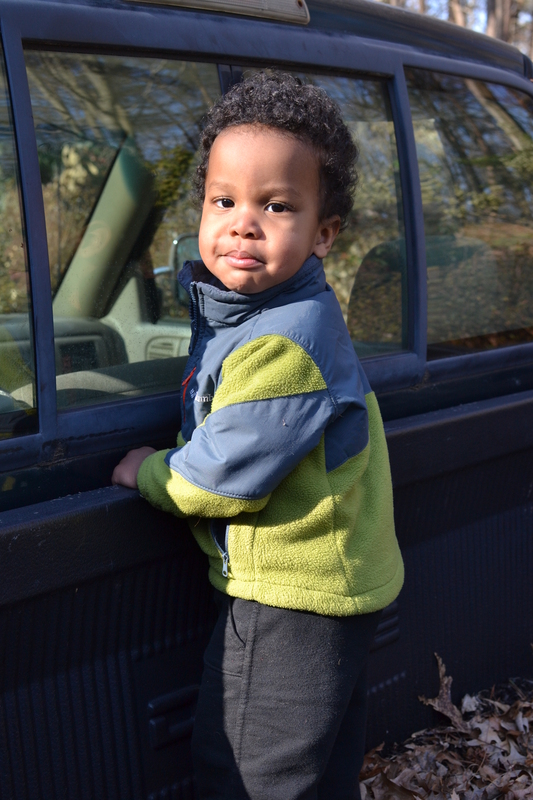 He loves pointing out what color things are – red truck, green tree, yellow coat, blue shoes. 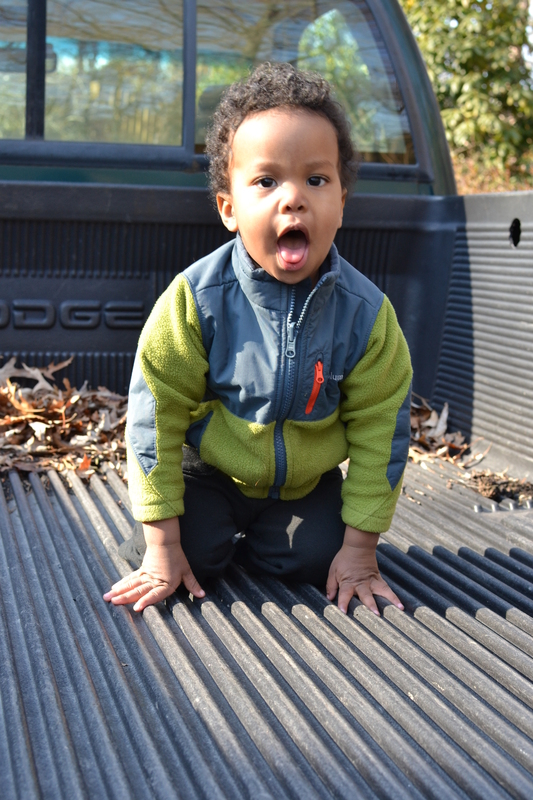 He loves saying “Daddy’s black jeep!”. He also knows all of his numbers now. He took the foam 4 and 6 out of the bathtub and carried them around the house for days. 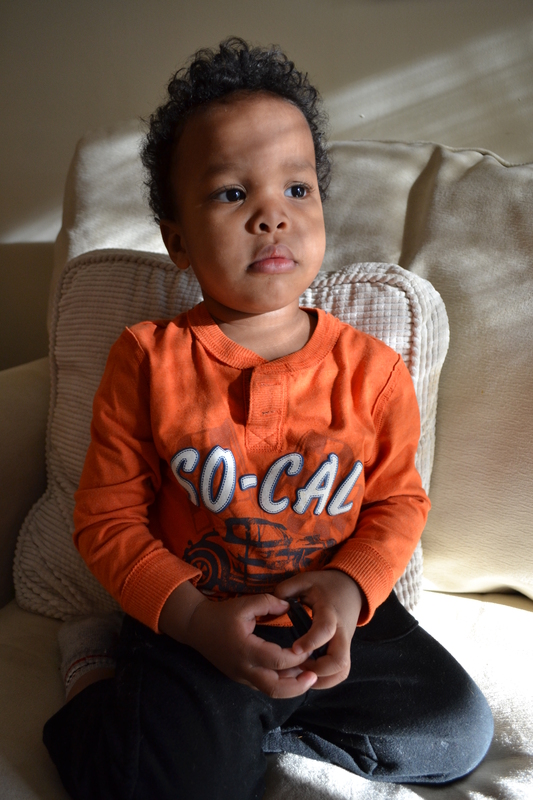 He can count two items now, and will pick up two pieces of orange saying “one, two!”. He can count to three, but refuses to do it when prompted. Oh well. Chris told him to count to one hundred the other day, so he could run upstairs for a second and Isaac started yelling, “One ten! One ten! One ten!”. Ha. He recognizes quite a few of his letters now. He loves finding the “I for Isaac” everywhere he looks. 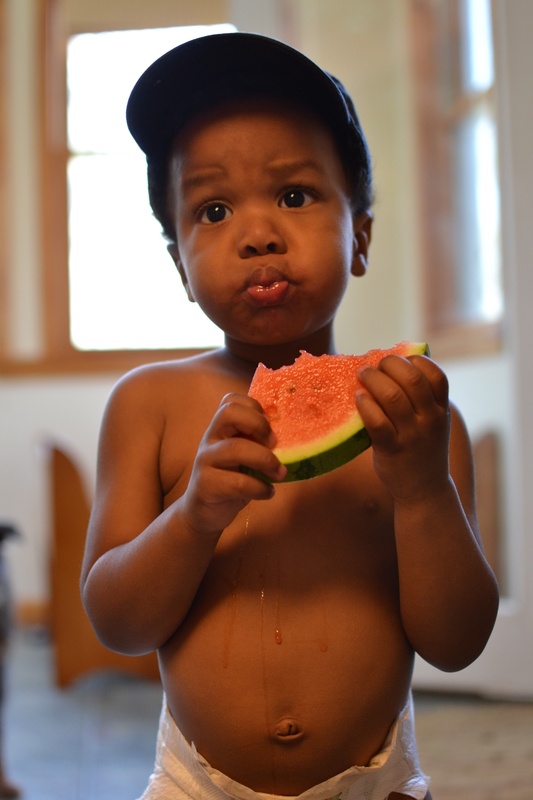 Isaac just started telling me “Baby do it hisself”, which blows my mind. He’s growing up too fast, really! He loves initiating the “Where’s Baby?” game. He’ll hide behind a bush or around the corner and we’ll hear “Baaaaby”, which is his prompt for us to say “Isaaaac, where aaaare you? Where’s the baby? Where’s Isaac?”. He’ll then jump out with a huge smile on his face. Rinse and repeat about a gadjillion times :). 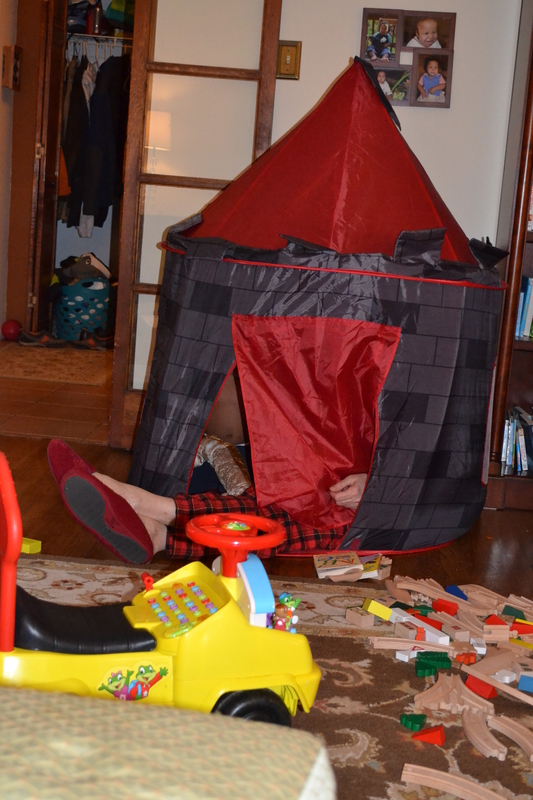 I was recently on crutches for a week, and although it was rough going trying to keep up with a super-active toddler, it brought an unexpected discovery. 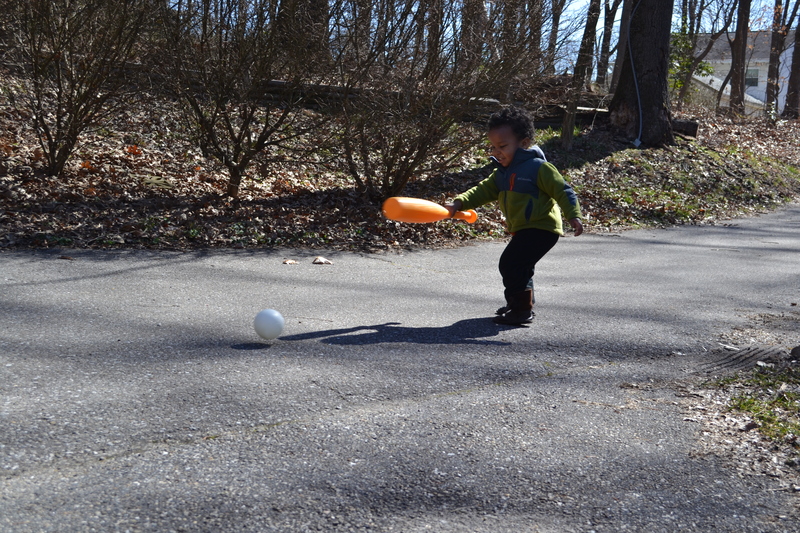 Isaac can play outside in the backyard all by himself! He loves, loves, loves being outside, and right about when I just couldn’t take him out the very moment he wanted to go out and play, he learned how to open doors. Ack! He slipped outside a couple times before I could stop him, and being on crutches, I couldn’t exactly make him come inside. He’s faster than me even when I’m not on crutches, haha. Luckily we’ve had some warm’ish weather, because he was out there in his pajama sleeper with no coat or shoes in a heartbeat. So we worked out a deal :). 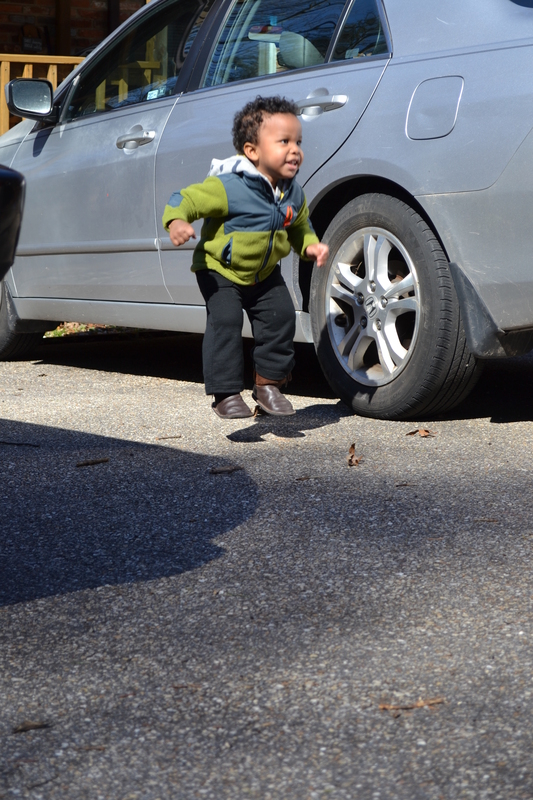 Isaac would let Mommy put on his coat and shoes, and I’d open the back door and just let him loose. 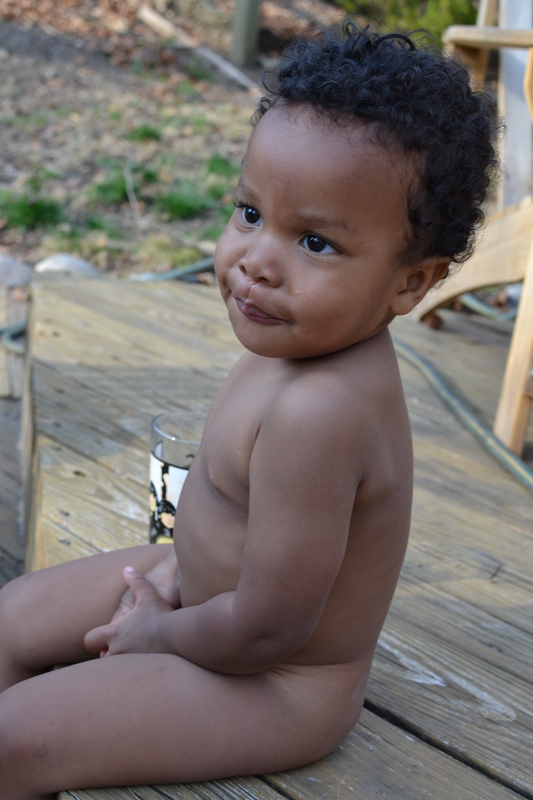 He’d wander the yard, playing in the dirt, throwing rocks, exploring the fenceline, climb up in his treehouse and slide down the slide, and I’d poke my head out every now and then to check on him (okay, probably every 30 seconds the first time!). When he was done playing, he’d crawl in the doggy door. Easy peasy :). 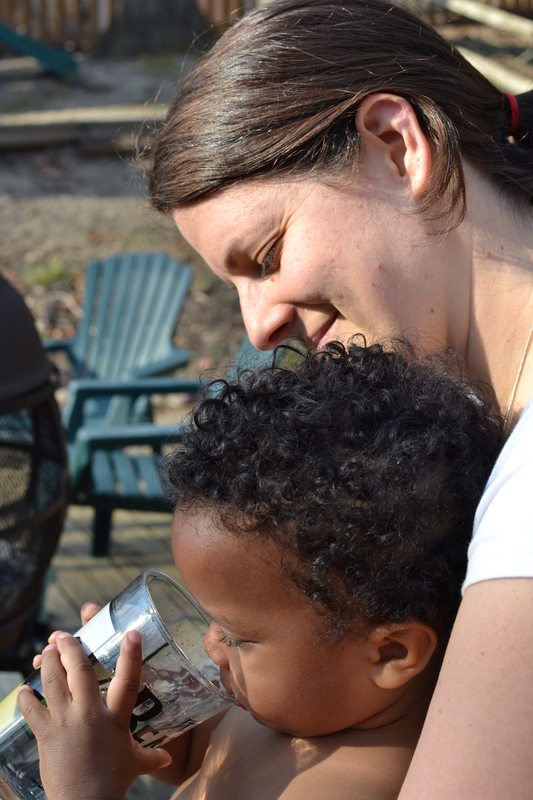 Now, Mommy can do the dishes after breakfast while baby plays outside. We go out front together in the afternoon to take a walk or explore the woods. It’s working out quite nicely! 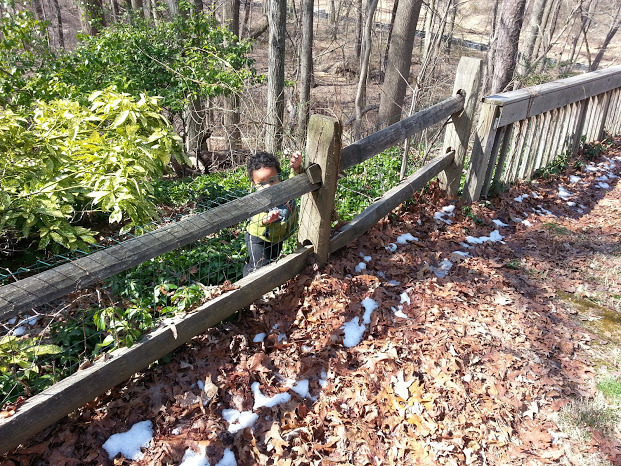 Okay, since I wrote that paragraph, he’s learned how to climb over the back fence. So…yeah. That’s fun. The boy cannot be contained! He hasn’t wanted to take walks in the neighborhood as much lately, mostly wanting to explore the woods instead. 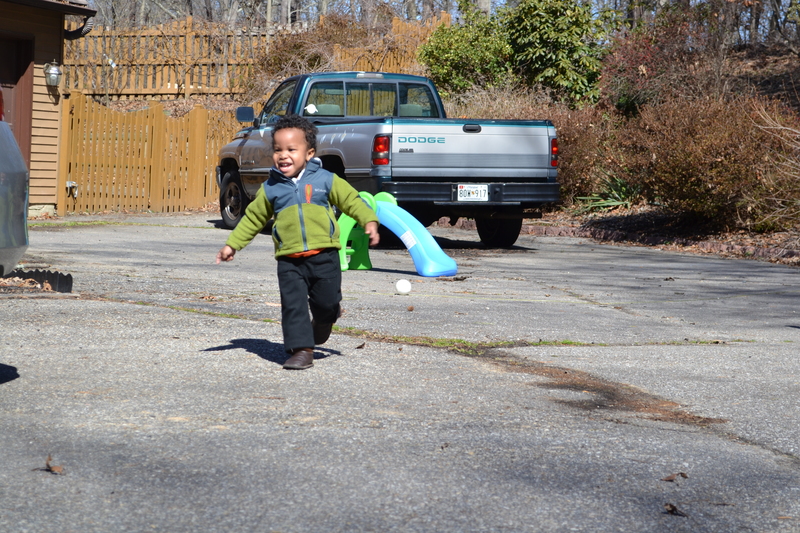 He loves walking his wheelbarrow all the way around the neighborhood, collecting sticks and pine cones. He loves the outdoors so much, and would spend every waking moment outside if I let him. On nice days, we easily spend 5 or 6 hours outside. 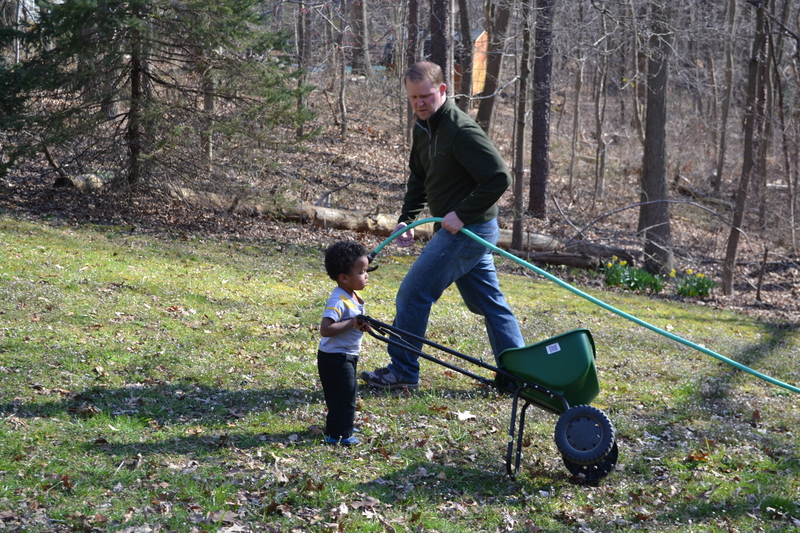 Now that the weather is warming up, there is plenty of work needing to be done in the yard, and he loves to help out with the raking and planting! Throwing is still something we deal with. He plays pretty rough with his toys, throwing them around on the wood floor, which drives me nuts. When he gets frustrated, he just starts chucking things across the room. But then I take his shoes off and toss them across the room toward the closet…so yeah, Mommy needs to start leading by example, I guess. We’re both working on it :). He gets frustrated really easily these days. He’s also started testing us, and when we tell him no, will look at us to make sure we really mean it…and some of the time will just do it anyway. He doesn’t like being corrected! 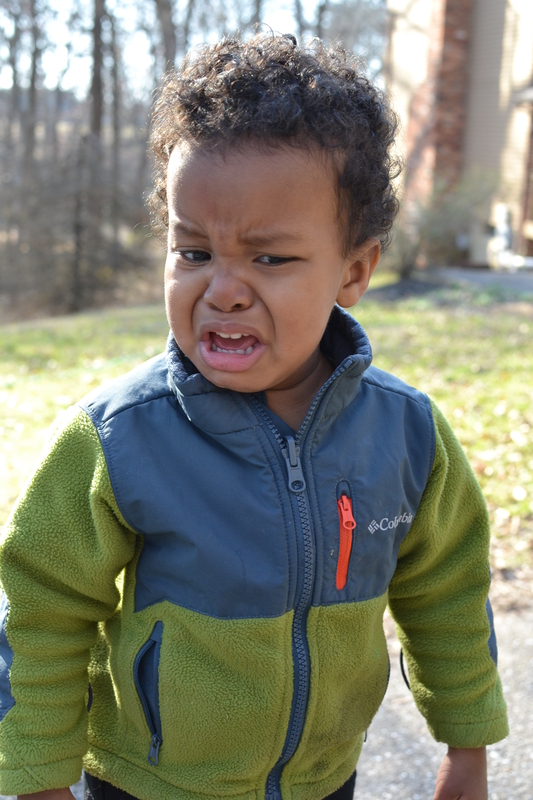 If only he wasn’t so darn cute, even when he’s crying! Sometimes he doesn’t even actually cry – his lip will start trembling, he’ll have the start of tears in his eyes, and he’ll just say in a wavery voice “kyyyying”. Oh my. I have to turn away and try not to die laughing. After he’s all calmed down, he likes to recount the event, telling me all about it and making sure I remember “Baby kying!”. 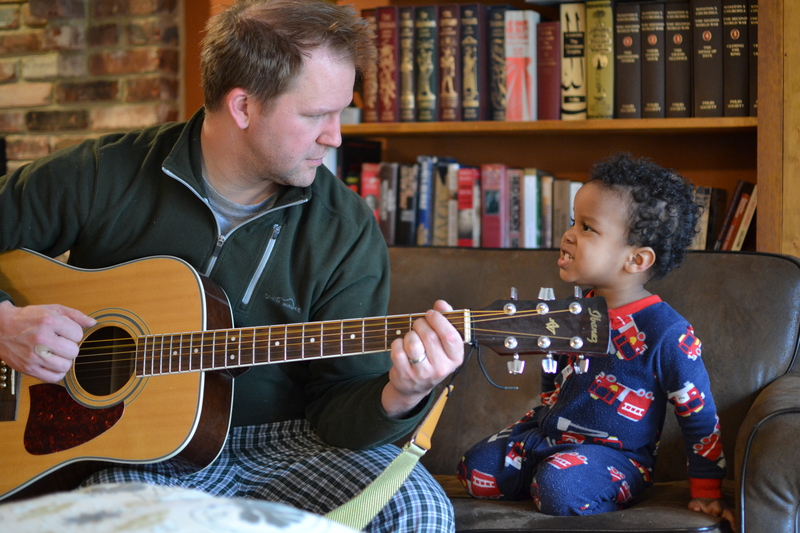 He especially loves to tell on Daddy to Mommy and vice versa. Ha ha. A few weeks ago, we got Isaac a little potty, and he’s been “practicing” pottying. He’s mastered the backing up and sitting down, haha. I’ll put him on the big potty before and after a bath, and he’ll tinkle even if he doesn’t have to go, straining his stomach to squeeze a few drops out. It’s super cute :). 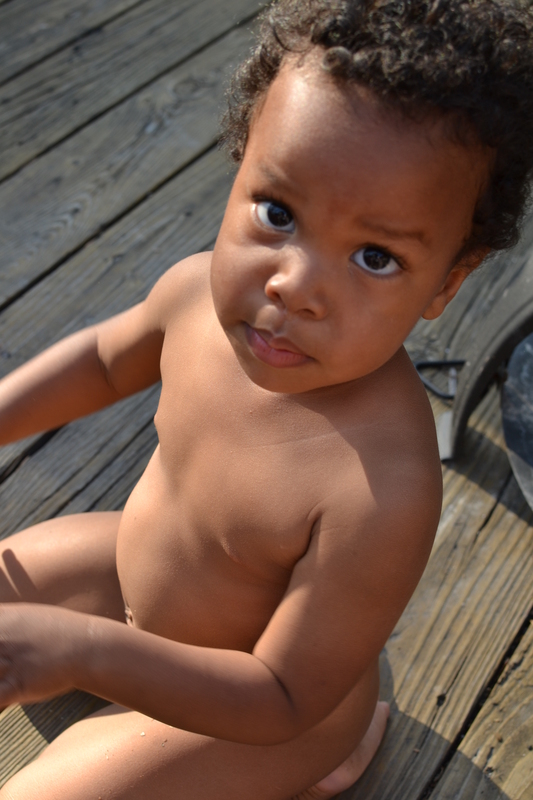 We’re waiting for warm summer weather to just go nekkid and do potty training for real. We had a couple warm days this week, but it’s still kinda chilly around here! 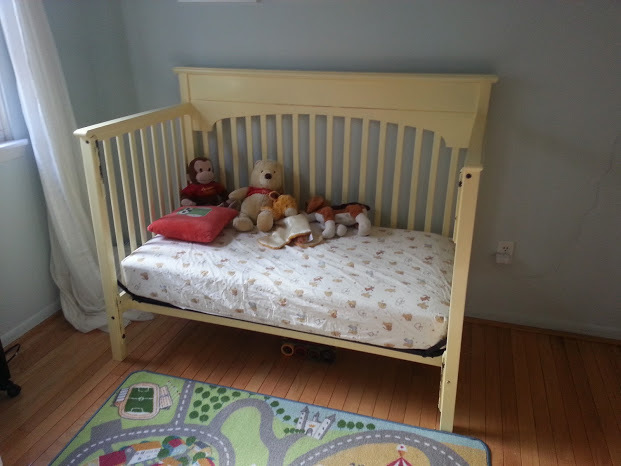 A couple weeks ago, we converted Isaac’s crib to a toddler bed. 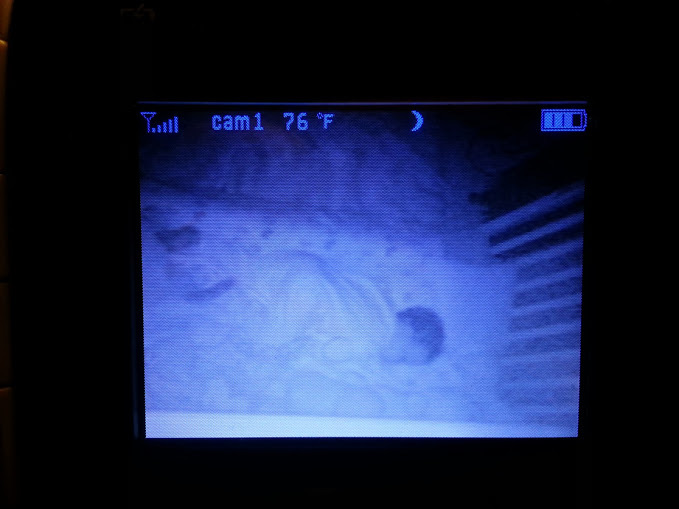 He has known how to crawl out of it for a while now, but just the day before he climbed out no less than 20 times in a row during his nap time. I tried turning his crib around so the high part faced out, but it took him about five seconds to figure it out and get out anyway. 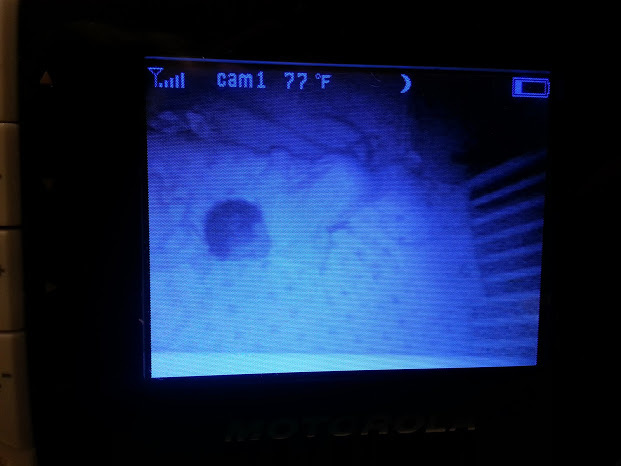 So, despite my wish to keep him in a crib for at least another year, we knew this wasn’t going to work. We tried it out for the first time at nap time and he didn’t sleep a wink (not a surprise). He wasn’t happy initially when I laid him down and kept demanding “Daddy home! Daddy HOME!”. He stayed in his bed for quite a while playing with his stuffed animals, throwing them all out and then reaching down to the floor to pick them up again. Then he got out and picked out some books and brought them back to his bed. He was exhausted, and I thought for sure he’d give it up and sleep, but we had some guys working on our gutters and the banging was too loud. At one point he laid down on his pillow and we heard him talking to himself, “Tractor. Okay, tractor. Tractor crying. Aaaaaah, tractor crying! Oookaaay, tractor.” After about an hour and 45 minutes, he’d finally had enough, walked over to the door and knocked, yelling “Crying! Crying!”. The next day, I just went in and put him back in bed every time he got out (about 5-7 times). He played on his bed with his stuffed animals for an hour and 10 minutes, then finally gave up and went to sleep. Hooray! He now knows that he’s not allowed to get out of his bed and will stay in it until I go get him out. He was so exhausted at bedtime the first night that he didn’t even try to get out and he fell asleep in about 10 seconds once we put him down. He fell out of the bed once about 4 hours later, but didn’t wake up, since I had put down a pallet of blankets on the floor next to the bed. We rolled up a blanket and stuffed it under the edge of his sheet as a bit of a “bumper”, put him back in bed, and he slept another almost 8 hours with no problem. Nights have continued to go smoothly since then, and with the changeover came an end to those early morning wake-ups, finally! He now sleeps from 7 or 7:30 until just after 7. Sadly, I think Isaac is trying to give up his nap. He desperately needs a nap, but he just can’t seem to fall asleep in his bed. 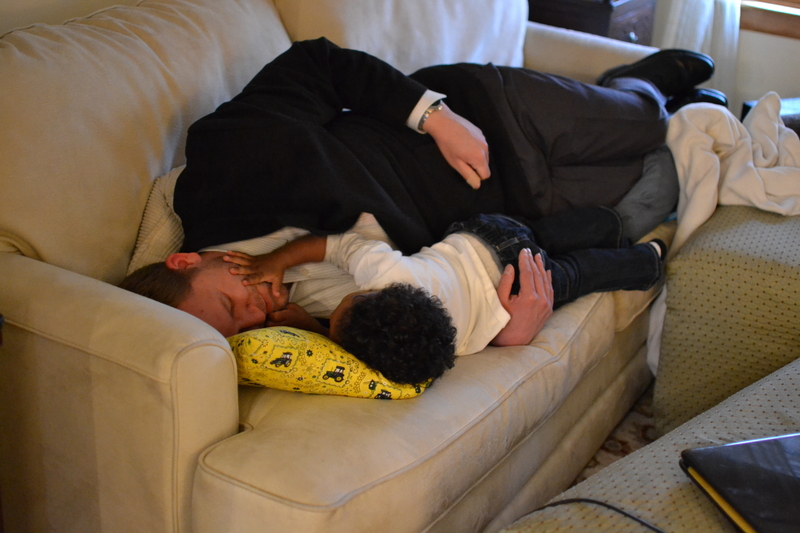 Even before we switched the crib to a toddler bed, it had been almost two weeks since he’d had a nap (except for the odd nap in the car seat). He is absolutely exhausted and wants to sleep, rolls around in his bed, lays still, trying his hardest to fall asleep, but just can’t seem to. He can’t make it to bedtime without a nap, so he’s not actually ready to drop the nap. I’m at a loss trying to figure out how to help him sleep. The kid is obsessed with his belly button! He HAS to be able to reach it at all times, but especially when he’s tired. He wants to be able to stick his finger in it while he’s nursing, and if I’ve put him in a zip-up sleeper, I have to unzip it so he can have access. He’d love to dig in my belly button, too, but it drives me absolutely nuts. He’s been going through a really clingy stage lately. He needs Mommy all the time, and will say “Hug, hug Mommy!” all day long. We traveled to Louisiana last week, and he was okay the first couple of days, but became so anxious by the end of the trip that he clung to me non-stop and it felt like he was crying all day long. He nursed twice as much as he normally does, and refused to eat more than a bite of food here and there. He also had a hard time sleeping. It was exhausting! Luckily, things returned to normal as soon as we got back home and he’s sleeping well, eating like a horse, and back to his giggly, smiley self. He is so attached to his Daddy! Ahh, I wish I could have seen his face when we came around the corner at the airport and saw Chris there waiting for us. He threw his hands up in the air, jumping up and down excitedly, and then started yelling “DADDY!!!!”. He hugged him so tight, and just stroked his face over and over. It was a pretty good welcome :). When Daddy gets home from work now, he gets the same reception. He loves crawling into bed with Daddy in the morning before Chris gets up for work, asking for Daddy to let him under the “cowers”, and snuggling in so sweetly for cuddles. 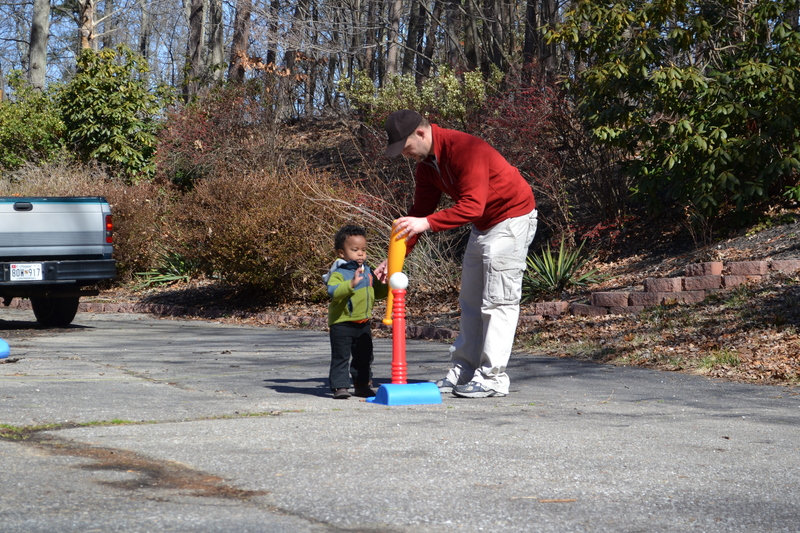 He loves playing baseball with Daddy in the driveway. 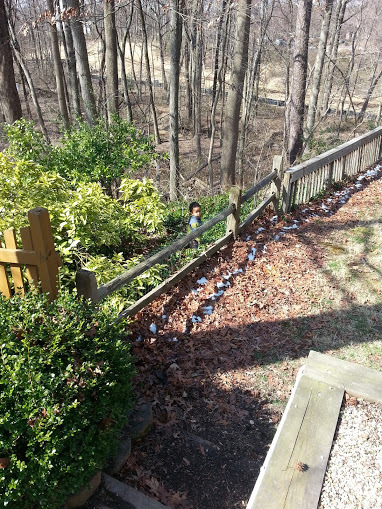 Isaac loves throwing the ball to Daddy…or into the woods, where Daddy has to fetch it, lol. 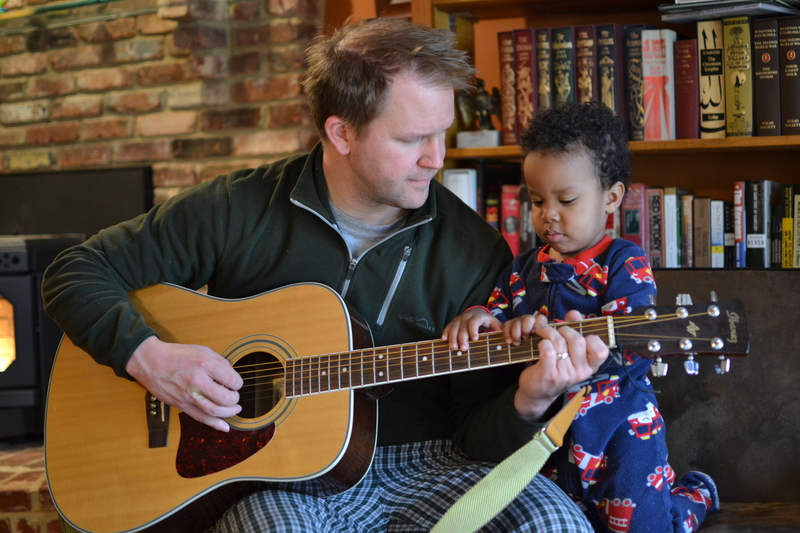 Playing gee-tar with Daddy is still one of his favorite things to do. He is such a fun kid. Such a big boy now. I can’t believe that my sweet little baby is almost two! April 13, 2013 in Isaac.